The New York style buffet was as its name reflects, inspired by a trip to New York. James Salmond was inspired by the sun that beautifully reflected onto the high rise buildings of New York City where the panes of glass were slightly different in their reflection. This luxurious feeling, the designer wanted to capture, with all of its splendor into a single design. As the high rise buildings were mainly all glass, this translated into the New York Buffet as rectangluar bevelled mirrors to get more refracted light and a dappled effect. 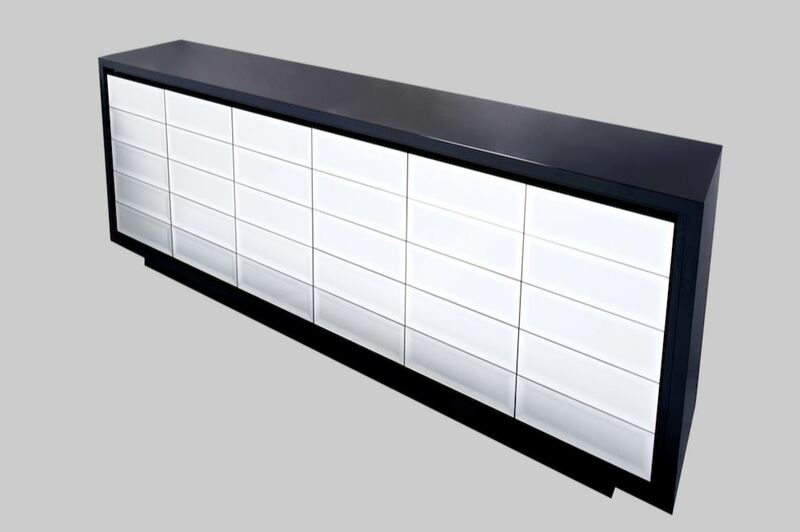 A stunning piece to suit any interior and as a show stopping centre piece for your dining area or lounge room. Doors with mirrored panels give acces to full storage space with adjustable shelves. Full gloss finish can be provided in different options and main colours or the mirrors in grey smoked or bronze for your custom unique styling and home.